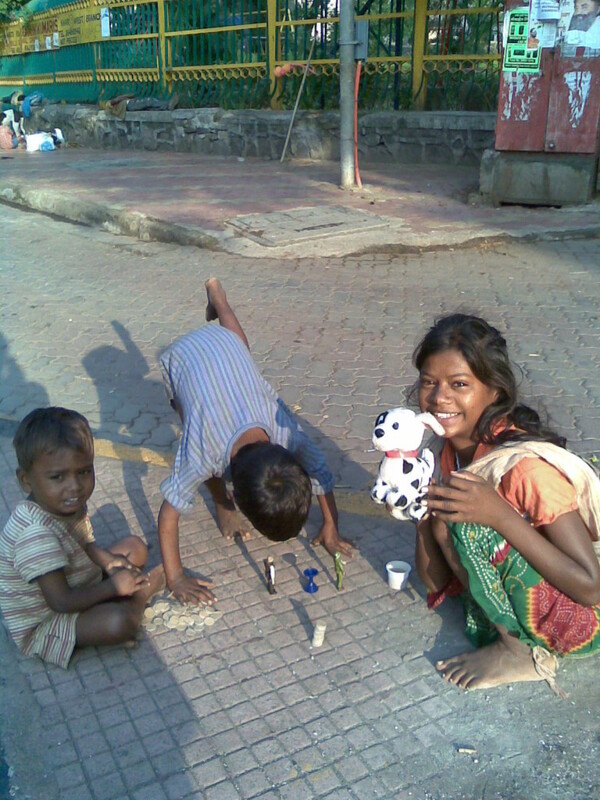 I couldn’t resist clicking a picture of these lovely children playing around Carter Road, Mumbai, early one morning. Do you see what I see? Then yesterday, I watched another little girl, hardly five, the daughter of laborers working on the road outside our house. She was in charge of her baby brother/sister who she invented little games to amuse her sibling. No toys, just an old towel! Later, last evening, I heard loud music, and an even louder Emcee in the skyscraper at the back of our building. It was a Christmas party for the children of the building. The Emcee kept yelling out instructions for the games…Santa visited…the children were constantly entertained. The children of the poor find ways to amuse themselves while the more ‘privileged’ children have to be entertained. What Christmas message are we giving our children? Is Christmas a time only for parties, music, and gifts? Wouldn’t it be wonderful if all these children could celebrate Christmas together? I was glad that I witnessed one such celebration, earlier in the week. I watched the children of the buildings and the children from orphanages entertain each other and us all. Thanks to the inspiration, hard work and generosity of a lovely couple – Clement and Annabelle De Sylva and and their neighbors and friends of St Anthony’s Road, Bandra. Isn’t the message of Christmas this that through the birth of God among us, we are one world, all brothers? Isn’t the spirit of Christmas this that we share and reach out? Lovely snap. Nothing like children smiling to make your day. Merry Xmas! It surely hurts when I see these little kids on the road side.It is my wish that all those NGOs who scream from TV studios,should arrange these kids to get together during such festivals like X'mass.May be they justify the title they have of NGO.Corinne,yours is a very touching post.